Growth and comfort will never co-exist, IBM’s chairman, president and CEO, Ginni Rometty, claims. And it’s the people and organisations willing to constantly take risks that will be successful now and into the future. 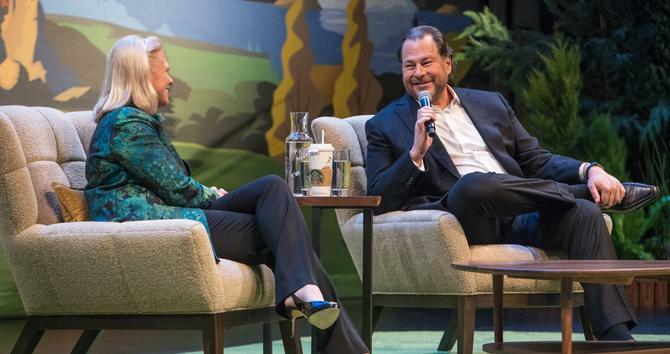 Speaking in conversation with Salesforce CEO, Marc Benioff, at this year’s Dreamforce, Rometty said it’s when people feel most at risk that they find the biggest successes. “You have to get comfortable with being uncomfortable,” Rometty told attendees, adding it’s particularly true for women and has been something she has continually experienced in her own career. “Ask yourself: When did you grow the most, and did you feel at risk? Almost 100 per cent of people will say yes. At 106 years old, IBM has sustained its role as a leading business technology vendor by constantly reinventing itself and taking risks, Rometty said. She pointed out 45 per cent of the products and services now offered by IBM were introduced in the last two years. Through all of this change, however, it’s been vital to stick to a set of core values, Rometty said. At IBM, these centre around delivering innovative technology for business and society. “Everyone has values, but it’s what you do when no one is looking that matters. We have a dedication to every client’s success, to innovation that matters, and to fostering trust and responsibility in all relationships,” she said. Trust and responsibility are particularly important in a world where data has become one of the biggest issues and opportunities of the time, and where machine-based intelligence has the power to disrupt every human on the planet, Rometty said. She claimed the onus is on AI vendors such as IBM and Salesforce to think about the moral and ethical consequences of these innovations. “It’s our job as those that make the technology to usher that safely into this world and in the right way,” Rometty said. IBM has published a set of three principles around AI which Rometty shared with the audience. The first concerns purpose. “We called it cognitive computing because AI had a negative connection. This is about augmenting what everyone does; the purpose is to augment not to replace man,” she said. The second principle is one of transparency. “For AI to thrive, you need to tell people this is the data that trained it, how you trained it. You can train bias into AI if you’re not careful,” Rometty said. The third thing to recognise about AI is that the world will need very different skills in order to maximise the opportunity and minimise the collateral damage, she said. “There is a huge obligation on all of us: Man and machine will be in everything. We have to prepare the world for that,” Rometty said. “You can’t turn your back on any of that. “There is a lot of fear mongering around AI killing jobs. It’s happened with every era of technology and yes, some jobs go away and some enter. We did an MIT study recently which suggested 10 per cent of jobs will go away, but 100 per cent will change because of this era. “This is about the man and machine working together. Not only is that a job you need to prepare the world for, we’re already seeing difficult problems of the world, such as healthcare, being solved by this era. For Rometty, ‘the industrial revolution 4.0’ is best described as one of data. She noted just 20 per cent of the world’s data is searchable by the big search engines; the other 80 per cent belongs to businesses and individuals but is still relatively untapped. And data pools are only going to get bigger with the rise of the Internet of Things, AI and other emerging technologies. There’s a chance the era of data will also favour companies that already exist in market, Rometty claimed, rather than the digital disruptors that have gained such significant commercial ground in recent years. To further illustrate the role technology innovators must play not just in their evolution, but also their ethical use, Rometty pointed to the work IBM is doing around quantum computing, a form of technology that supersedes the traditional binary code limitations of current computing models with infinite configuration possibilities. The first areas Rometty saw benefitting from quantum computing are drug discovery, and material sciences, followed by logistics and financial modelling. Rometty also touched on the transformation that’s occurred at IBM to keep up with the increased speed of technology innovation and change. The first component of this has been embracing design thinking and the idea that everything the company builds should start with empathy. Today, IBM has 10,000 staff working with clients on design thinking and 1200 doing work internally. “That started us on the journey of getting to that business-to-person approach,” she said. To answer the question of whether IBM could be big as well as fast, the business commenced on an agile journey where small multidisciplinary teams work to produce a minimum viable product and iterate. “What I realised is that our employees can’t work faster unless we changed the way they work,” Rometty said. Today, 200,000 employees are doing agile, a change that led to 170 building renovations globally, and a rethink of appraisal systems. Then IBM took on Net Promoter Score as a way of better understanding its customer approach. “That has been a wonderful insight with all this feedback coming in and that also led to how work changed,” she said. Through all of this, passion and persistence have been personal drivers of success, Rometty said. At a more holistic level, diversity and inclusion have been vital cultural elements. “You have to progress from diversity to inclusion and that means having employees who feel comfortable to give and participate,” Rometty said. “Representation is necessary but it’s not sufficient. There’s no silver bullet to this, it’s about pervasiveness. - Nadia Cameron travelled to Dreamforce as a guest of Salesforce.